Whether you are signing your name for a loan or contract of any other kind, the document could be your undoing. While lenders could make you feel like he or she has the "best of intentions" for your particular situation, you could be signing an agreement that could put you on the hook for more than you may realize. Anyone who has you signing a contract of any kind is doing so in order to gain something from the situation. Do you know what's in that 20-page contract you were handed? What do you need to look for before you sign your name? Pages - Each contract needs to be numbered. 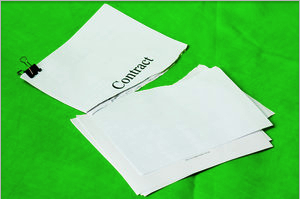 For instance, you should see something along the lines of "3 of 20" or the like on page three of your contract. If the pages are not numbered, then anyone can add any additional information they want in order to increase their own benefit. If an organization or person refuses to number the pages, you could be in serious trouble later on. Regardless of how "shiny" the deal is, it would be in your best interest to not sign the document. Initial - Another aspect that professional and legal contracts utilize is the method of having the signor, you, initial ever page of the contract. This way, the contract cannot be in dispute if you initialized the very page that is in contention. While Photoshop can easily place your initials on any page a company wishes, there are ways to contest against forgery such as the fact that it's extremely difficult to duplicate your signature or initials twice in a row unless you're trying. If a page has an identical pattern to your pen stroke as another, then it's most likely copied. Duplicates - Always ask for a copy. Most legitimate practices will automatically hand you a copy of the document you just signed, but demand one if they don't. You should always have a copy of a document that you signed regardless of how small or mundane the situation may be. You signature on the wrong document could have you battling in court for years to come. Amendments - If there is something not covered in the contract, you need to have the developer amend the document. Verbal agreements can only go so far and you need to have the entire ordeal covered in writing. Some individuals may try to talk you out of it because of the work involved, but you don't want to be subjected to not having vital information included in the document. Read the Contract - And most importantly, always read the contract before signing anything. If there is anything you don't understand or that needs clarification, have the individual explain it right then and there. Misunderstandings are next to impossible to defend against in court, depending on the situation. Most courts will attest that if you signed it, you must have understood the premise of the contract. While it may seem cynical, go into signing a contract with the belief that the other party is trying to get away with more than you're willing to give. Examine every piece of information with scrutiny, and never be afraid to ask questions regarding information on the document. Even the wording of particular points could be cause for alarm as it could be misunderstood by other parties. About the author: This article is contributed by Madoline Hatter. Madoline is a freelance writer and blog junkie from ChangeOfAddressForm.com. You can reach her at: m.hatter12 @ gmail. com.